Panasonic NDI IP PTZ Camera Joystick Controller Software PTZJoy™ from Rocosoft greatly simplifies management of Panasonic cameras connected to a LAN, WAN, and Wi-Fi network as well as cameras that connect to a computer via serial RS-232, RS-422, or USB ports. That includes Panasonic: AW-HE40, AW-HN40, AW-HE50, AW-HE60, AW-UE70, AW-UN70, AW-HE38, AW-HN38, AW-HE120, AW-HE130, AW-HN130, AW-HE140, AW-UE150, and all newer Panasonic PTZ Cameras. 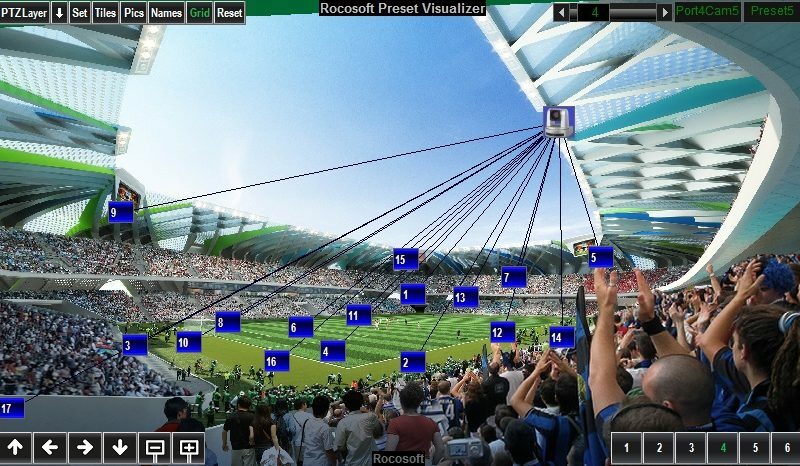 Rocosoft PTZJoy™ Panasonic Joystick Controller Software is a robust camera management software for local and far-end control of Panasonic PTZ cameras from a computer, tablet, TriCaster, vMix, Livestream, Wirecast, and other Live Production Systems. 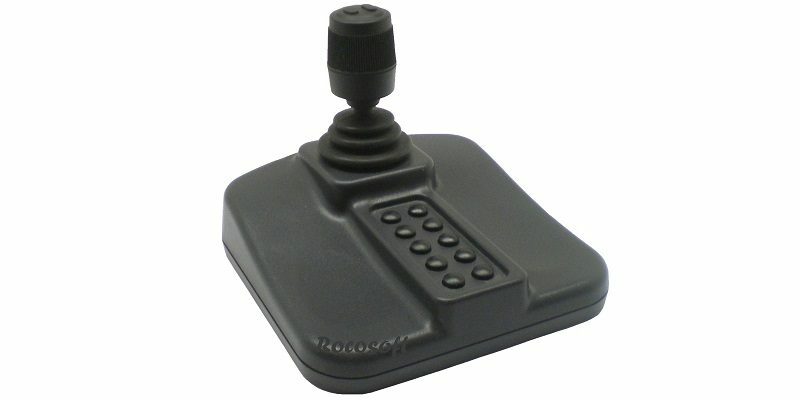 It will allow you to ditch your bulky limited functionality hardware joystick controller and replace it with the computer based controller that is more precise and offers tons of extra features. 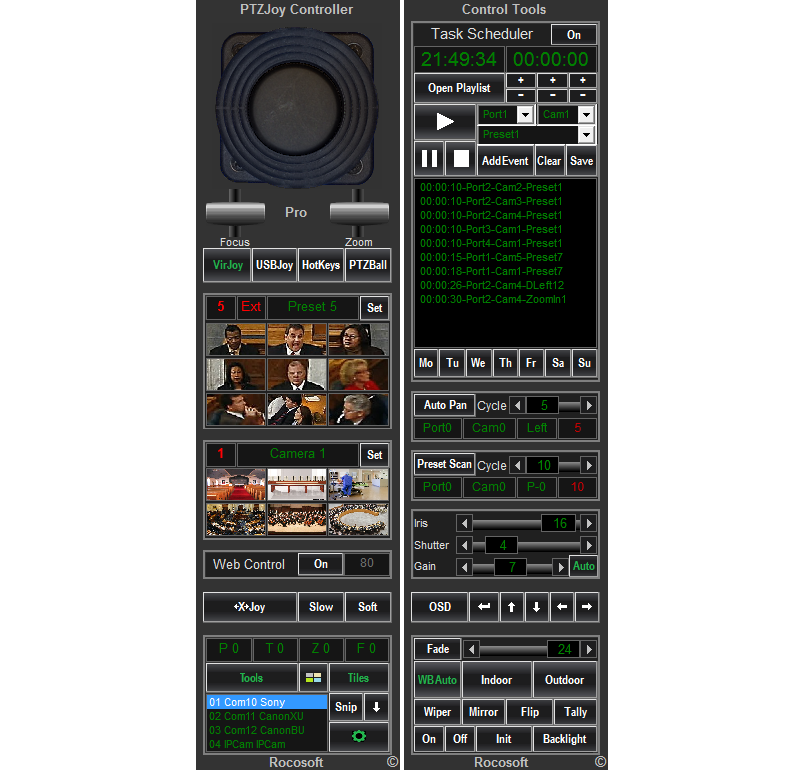 Even simplest Rocosoft PTZJoy Software, used in conjunction with any USB joystick, will give you more precise and simultaneous Pan, Tilt, and Zoom controls with true variable speed plus a lot of extra features. You can control Pan, Tilt, Zoom, Focus, Iris and easily switch between cameras using any professional or gaming, wired or wireless, xBox or regular USB Joystick. You can also use virtual on-screen controls, keyboard shortcuts, or directional on-screen buttons and manage camera presets with visual preset tiles that offer full customization with your own graphics. Rocosoft EasyPTZ™ VISCA CONTROL/HD-SDI VIDEO/POWER Extendable Cable Sets allow you to build your own professional PTZ Camera Control System with superior quality, unparalleled functionality, reliability, and simplicity. Whether your setup is simple or complex, we take the guess work out of it – no need for converters, USB adapters, wiring diagrams, or separate cable runs – all you need is one of our convenient PTZ Control Balun Extenders. Just add your CAT cable. Shop all PTZ Gear.